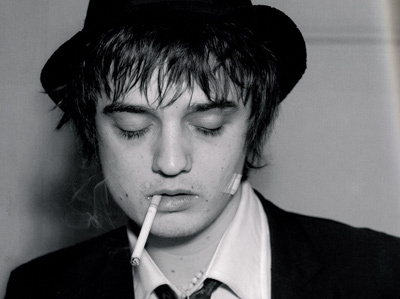 British Rocker, Pete Doherty, 32, claims that he is being haunted by the ghost of Amy Winehouse. The singer of The Libertines and Babyshambles is so frightened of the ghostly apparitions that he has fled his London home and escaped to Paris. The Sun newspaper spoke to Doherty’s friends about his troubles and they insist that the 32 year-old is so terrified, he can no longer stay in his home. The troubled Brit told friends that he has seen Winehouse’s ghost at least three or four times since her death in July. The former Mr. Kate Moss has apparently seen the late singer’s reflections on his windows and has seen her ghostly images in his bedroom at night. The source told The Sun, “He is utterly convinced that he has seen her ghost. A lot of people will think his visions are probably drug-induced but he claims he is clean.” Hmmm, now why would anyone assume that Doherty’s ghostly visions were drug-related? Doherty and Winehouse were often seen photographed together around London and they performed numerous times together, most notably during 2009’s V Festival. The rocker was reportedly so distraught over her death that he could not bring himself to go to her funeral. Really? What a great friend. Maybe Winehouse is coming back from the grave to haunt him for failing to pay his final respects. Next Post Apparently Being a Sitcom Star Makes You Psychic! I would be scared if i saw Amy Winehouse's Ghost too. Poor little guy.